We own a lawn service and my son needed these for the cold fall/winter/early spring weather....he loves them! They are warm and easy to move around in. He wears them anytime he has to be in the cold for extended time. I even bought myself a pair. You will love these! THese are the only bib style coveralls my husband will wear. Very Durable and last. Love them!!!! I am very impressed with the bibs. They came early, and fit great. Great product and very well made compared to the cheaper brands. Love these bibs. Easy to put over the clothes I have on to layer up. And easy to take off if you get to warm. I would recommend them. Well made and very durable. I wear 38 pants ordered 46 to accommodate extra layers. Warm but they give you the freedom to move. Used them while out running the snow blower in sub zero temperatures for 2 1/2 hours. Wind chills were below -30F. I stayed comfortable. The perfect amount of insulation for staying outside and active during the Polar Vortex, or more accurately what we call winter in the Northern Great Lakes region. In my own opinion, these are incredible. I use them on a daily basis, and they hold up to everything I throw at them. Tough and built with pride, it’s hard to say ‘NO’ to anything from Carhartt. Keeps me warm in the cold. Good stuff. These are great for outdoor work in the winter. Keep me warm and protected. Had to buy two sizes bigger than reg Jean size to get comefortae. Zipper legs, button sides, lined on the inside. Works great in our cold weather! This is a great product, don't change a thing... Please! This is the second set of my life, the first was over thirty years ago. I still wear them but they are a bit snug and threadbare in spots. The new set, fit is good now. I hope after washing it remains the same size. I use them professionally, I make my living in them. Worth every cent. I stay warm and cozy in them. They’re fine but hate the bib fasteners. The old style with buttons were much better. Pay attention to size recommendations. I bought them big but they shrunk up after one washin and now are snug with clothing under them. Always try on before purchasing.Size depends on how much clothing you wear under them (sweatshirts, hoodie,jacket).My last pair I wore at work regularly during fall and winter and lasted 16 years.A winter must for working outdoors!!!! Great product. It took a bit to figure out the sizing. I’m a 33x33, and I fit a 36x32 in these. They are warm, durable, and comfortable! Sizing chart is way off !! I like the product however the sizing chart is incorrect and the return policy is not customer friendly. I ordered according to the sizing chart and the first bibs were way to small, no fault of mine. I followed the return process and it cost me $25 to return them!! I them ordered them again, this time three sized larger in the waist and they fit! I do not wear that waist size in any other pants/products I own. I love it !! Specially with this cold fronts , I have one for 16 years I just wanted different Color Thank You So Much ! ?? I wore them using my snow blower to remove 6" of snow. I was warm and toasty even though I had gym shorts on underneath. The fasteners are a bit thinner that my other pair I bought 20 years ago. These will more than likely outlast me. Customer service I give a 5 star rating. They returned my first pair without a hitch. These run tight, length is right. Feel heavy duty. I'm 6'5 about 220lbs. Wear 34x36 jeans. Ordered the recommended 36x36 bibs and they fit with little room left over in the belly area. Think tshirt or thermos. So I returned for a 38x36. Well see. Looked well made, awesome experince the Carhartt store. Great for layering under and over! The length is true. Go two sizes bigger in waist if you want to wear jeans/layers under. Great bibs, I wear a 34 waist in carhartt pants. So I went up to a size 36 bibs so the would fit over them, the bibs fit great but, if wear thermals along with pants you may want to go two sizes up. Everything I thought it would be. Just what I needed for working in the woods. I order a big size so that I could wear extra cloths with them. Perfect fit. Fit is good, very warm while snowblowing in upstate NY! Well made. Confident I’ll have these for years to come. They say to use your regular inseam length but I find it too long and bunchy. Got them for my husband for Christmas, he LOVES them. We did have to bring them back due to the stomach being to tight. Everything else fits great. Fits great and I'm sure it will wear like iron. 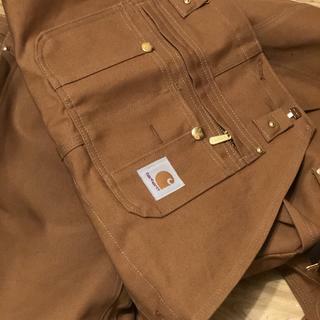 After all, it's a Carhartt! I bought these to play on ATV's and in the snow. Because I'm tall, I bought the mens and I'm very pleased with the fit and performance. Theyre tough and warm! Garment is great as usual, I was trying to get one for my wife in men’s size but did not fit, we returned it, and will get her something on women’s size. Have worn them for years, like them a lot. Holds up to hard work on my ranch, nothing else compares! Overall happy with purchase, does seem to run a little small - was recommended to purchase size 2” more than waist size: I would recommend 4” if you plan on wearing over jeans, etc. I was so happy that I went to the local store to try these on. They do run small. However the quality, appearance, and wearability are awesome. The hold up very well. The sure kept me warm. THIS WAS A CHRISTMAS GIFT FOR MY NEPHEW WHO WORKS IN LANDSCAPING AND IS OUTSIDE IN THE COLD WEATHER. HE SAID HE LOVES THEM AND THEY ARE GREAT! Great quality at a affordable price. These bibs make working in cold weather bearable. 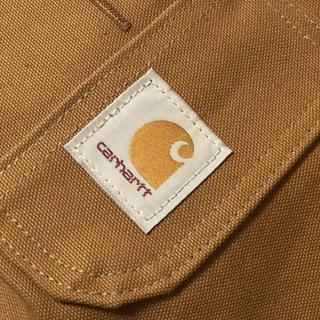 The quality is what you would expect from Carhartt. Durable, Comfortable & Affordable. We're sorry to hear this. Please note that you do have to take your midsection measurement at the fullest part and upsize 1-2 sizes from that, depending on whether you plan to wear layers underneath or not. BEST ANSWER: Yes, Style R03. Can you put these on without having to take your boots/shoes off? BEST ANSWER: I have a pair of Cabelas’s Trans Alaskan pac boots, I can get my bibs on without taking those off, so I would say you can get the bibs on over at boot. I can but my boots are 6” high. Most of the time I pull my boots to take them off though. Yes. The legs unzip to your thigh, allowing your boots to pass through the pants legs. Yes, but it is challenging. My husband is 6'2" and has a 50 inch waist. He would need a 54 X34 but this size is not available. Do you make these is this size? BEST ANSWER: We apologize that we do not manufacture this size. Are buttons or a zipper used for the groin closure? BEST ANSWER: This style will have a zipper fly. Today, I found in a store a pair of Moss colored quilted overalls that I loved but they weren't my size. Your answer section says that R27 is offered in moss but the website doesn't offer moss as a choice. Are any of your bib overalls offered in moss? BEST ANSWER: The Moss color was discontinued. what weight in ounces of insulation do your different options of bib overalls contain? BEST ANSWER: Please contact us at 1 800 833 3118 so we can look further into your questions. Why no chest zipper anymore? Looking for new bibs. Not happy with what I've found in stores. No zippers to hips, or chest zippers. BEST ANSWER: This style will have a chest zipper. It will also have a zipper to your thigh. Why is 32x28 unavailable? I wear 29x30 jeans. and def don't want a huge, long bib. I wear pants below below belly 46 waist. Beer belly measures 58 largest point round. What size do I need? BEST ANSWER: We recommend going up 1-2 sizes from the biggest point of your midsection. The largest size in this style will be a 58, which will unfortunately be too small. BEST ANSWER: No, these are not waterproof. My husbands overall buckle broke how can I replace them? BEST ANSWER: Please contact us at 1 800 833 3118 for further assistance. Just got a pair of R02/DNY and I can’t find them on your site, are they discontinued? BEST ANSWER: We apologize, but the R02 has been discontinued. We recommend the R41 as a suitable alternative. which measurement comes first waist or inseam? BEST ANSWER: If you are reading the information off your garment tag, it should be waist x inseam. Please contact us at 1 800 833 3118 if you need sizing assistance. unlined or lined bibs for spring weather? for spring I prefer the unlined it allows for a more comfortable fit so you can bulk up if needed underneath and it doesn't stick to you if you sweat a bit during work. Unlined is better in the southern part of the country for me. If you need to warm things up a bit if weather changes, just add a base layer to you bib. can the inseam be altered for those of us with large waists and stubby legs? BEST ANSWER: Unfortunately, we do not offer custom garments. We do not recommend trying to alter this garment, especially given the fact that the legs have zippers. I have a pair of another brand's overalls and they are super warm but really beefy, it's too hard to move around in them. Are these the thinner ones that are mobile? BEST ANSWER: They are reasonably thin, considering the fabric layers involved. I find when they are new or freshly washed, that can certainly make them feel stiff and rigid. After a couple months of wear, they definitely “break-in” though. Maybe want to upsize one size if you plan on wearing other garments underneath them. That will definitely help reduce the bulky, rigid feel. I agree with Seth D.
I come in at 340 lbs, and bought one of these I think two sizes bigger than my pants. They have good mobility, fit over my pants and boots with ease, block the wind like a champ, but are a tad stiff. Maybe with some wear in time they will loosen up for us. The quilted liner is about 1/2” thick. The outer material is thick and maybe hard to bend down in at first but they soften up with wear and a few washings. Going an extra size larger might help too. They are thinner, but very warm. They have a waterproofing on them that makes them great in the snow. I hope this helps. They are a structured material and are easy to move around in. Yes they are the thinner ones and quite mobile. I was them and put them in the dryer for a bit then hang them up and they are good to go the next morning. I am very fond of them. husband wears 34/30 what size should I get him? BEST ANSWER: If he plans to wear heavier layers underneath, you would go up two sizes to a 38. You would order his normal inseam. 46x32 would be compared to 2xl or 3xl? Are R03 Bibs Black the only Black Bibs made in the USA? I really want a R41 or R27 with Nylon lining quilted midweight polyester insulation, but they are imported. BEST ANSWER: Style R03 is the only bib style that we currently offer that is made in the USA. Can these overalls be washed in a standard washer? BEST ANSWER: Yes; just be sure to follow the care instructions on the tag. My boyfriend wears 48 talks in jeans what size inseam should I get ? BEST ANSWER: We recommend the same inseam as he currently wears, however this style is only offered in sizes up to 36 inseam. We apologize for the inconvenience. If my Jean size is 35-36 and inseam is 32. 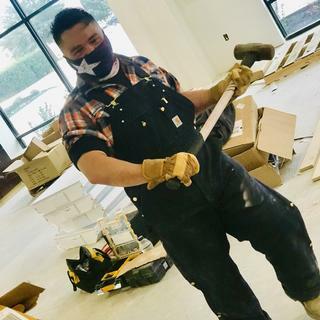 What size lines bib overalls should I get? BEST ANSWER: Assuming your midsection measures 35-36" at the largest part, you would probably want to order a 40x32. This assumes you will be wearing clothing underneath. If you only plan to wear undergarments underneath, you may only need a 38x32. I like the zipper pocket on these but like the arctic lining on the R03. Is the arctic lining noticeably warmer than the lining in these? BEST ANSWER: We don't temperature-rate our garments. However, the R41 has a midweight lining. The arctic quilt lining found in the R03 is the warmest lining we offer. What size overall insulated bib would I be if I'm a 34 waist 34 long in jeans? BEST ANSWER: For this style we recommend a size 36 if worn over light layers and a 38 if worn over heavy layers. BEST ANSWER: Style R38 would be the closest replacement. what coat is the closest match to this bibs? BEST ANSWER: You would want to look for firm duck coats and jackets in the corresponding color. Examples include J140, J131, C003, C001, J001, J002, and 102707.
your new model 27 overalls are sized medium , large or extra large . How big is the waist of the size large ones ? BEST ANSWER: Please contact us for assistance. BEST ANSWER: You would want to measure these around your midsection so that the stomach is taken into account as well. Then, refer to the size guide specific to this item. Yes they are machine washable. I have had these for years and are a great product. Can we order 40 length anywhere or get some unhemmed? BEST ANSWER: We apologize, we do not offer 40 inseam.